Summary and Definition: The Mohawk tribe were fierce, warlike easternmost members of the powerful Iroquois Confederacy. They lived along the Mohawk River of the Mohawk Valley in upstate New York to Southern Quebec and Eastern Ontario and were and considered by the Iroquois confederacy as the "keepers of the eastern door". The Mohawk were one of the most feared of all the Native Indian tribes and terrified their enemies due to the violent and brutal way in which they waged war. What was the lifestyle and culture of the Mohawk tribe? The Mohawk tribe were a hunting, fishing and farming people who travelled extensively along the Mohawk and Hudson rivers in their elmbark canoes on hunting, trading and war expeditions. The warlike Mohawk were feared across the region due to their brutal tactics and merciless way they treated captives. Deganawida and Hiawatha established the Constitution of the Iroquois Confederacy to unite the Iroquoian tribes and eliminate the incessant inter-tribal warfare and end the custom of cannibalism. The tribes of the Iroquois Confederacy waged warfare on all of their neighboring tribes until they had all been conquered. The Mohawk tribe had the earliest regular fur trading contacts with Europeans including the Dutch, Swedish, French and British. The Mohawk became allied to the British against the French during the long French and Indian Wars (1689 - 1763). After the American Revolution, most of the Mohawk relocated to Canada, where the vast majority still reside today. This article contains fast, fun facts and interesting information about the Mohawk Native American Indian tribe. Find answers to questions like where did the Mohawk tribe live, what clothes did they wear and what food did they eat? Discover what happened to the Mohawk tribe with facts about their wars and history. What language did the Mohawk tribe speak? The Mohawk tribe spoke in the Iroquoian language. The Mohawk called themselves the 'Kanienkahagen', meaning the "people of the flint" in reference to a mighty arrow with a powerful flint that features in their creation story. The name Mohawk was given by their enemies and derives from the Algonquian word 'Mohowawog' meaning "eaters of men", referring to their practice of ceremonial cannibalism in order to absorb the strength of their enemies. The Mohawk were members of the group of tribes referred to as the Iroquois Confederacy was founded c1550 by Deganawida and Hiawatha and consisted of the Mohawk, Seneca, Oneida, Onondaga and Cayuga tribes. The aim of the Iroquois Confederacy was to create an Iroquoian empire by absorbing subservient, conquered peoples. Adherence to the Constitution of Iroquois Confederacy was embodied in the Grand Council attended by 50 Sachems, called Hoyaneh. The Mohawk tribe were represented by nine Hoyaneh. The goals of the Iroquois confederacy were met. The neighboring tribes of the Great Lakes and Ohio Valley fought for dominance of the beaver fur trade, but were conquered by the power and unity of the Iroquois Confederacy. By 1670 the Huron, Potawatomi, Fox, Sauk, Neutrals, Kickapoo Miami, Ottawa, Illinois, Osage, Kansa, Ponca, Omaha, Erie and Susquehannock had all been forced to move from their original locations. Where did the Mohawk tribe live? The Mohawk are people of the Northeast Woodland Native American cultural group. The geography of the region in which they lived dictated the lifestyle and culture of the Mohawk tribe. What did the Mohawk tribe live in? The Mohawk tribe lived in large fortified villages of longhouses in the winter. The longhouses were built by the men but owned by the women. During the summer months the men travelled away on hunting expeditions living in temporary pyramid or dome-shaped shelters called wigwams (wetu). The Mohawk wigwam was built with wooden frames that were covered with woven mats, sheets of elm bark and animal skins. Ropes were wrapped around the wigwam to hold the elm bark in place. The picture at the top of the page depicts Thayendanegea (1743 � 1807), also known as Joseph Brant, who was a chief of the Mohawk tribe. It was painted by the artist Charles Bird King in 1835, but based on a 1806 portrait by Ezra Ames. 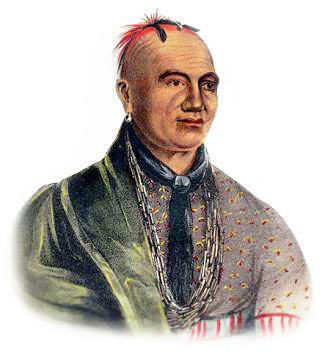 The hair of Thayendanegea (Joseph Brant) is of interest as it depicts the traditional hairstyle of the Mohawk tribe. The Mohawk plucked (not shaved) their hair leaving short tufts which they then dyed with red ochre and then braided. The common perception of the "Mohawk" hairstyle is actually taken from the Pawnee tribe. What clothes did the Mohawk wear? The clothes worn by the early Mohawk people were simple and made from animal skins or elm bark. The clothes worn by the men included long breechclouts, leggings, shirts, long cloaks and shoulder to waist length mantles. These were made from the skins of deer (buckskin) raccoon, beaver, otter and moose. Mohawk women wore wraparound skirts, tunics and cloaks. Moccasins were made of one piece of animal skin with a high collar that could be left up or folded down. The ankle moccasins were greased on the outside for additional waterproofing. The Europeans introduced trade cloth to the Mohawk tribe who then began to adopt a more European type of dress. What food did the Mohawk tribe eat? The food that the Mohawk tribe ate included the 'three sisters' crops of corn, beans and squash. These crops were collectively known as 'deohako' meaning "life supporters". Fish such as salmon were an important part of their food supply. Hunters provided meat from deer (venison), moose, black bear and smaller game like squirrel, duck, rabbit and wild turkey. The Mohawk food also included nuts, vegetables, mushrooms and fruits (blueberries, strawberries and raspberries). The Mohawk people used food preservation methods of drying and smoking to ensure that foods was available through the winter months. Their food was prepared in different ways and included soups, cornbread and stews. What weapons did the Mohawk use? The weapons used by the Mohawk warriors included bows and arrows, war clubs, tomahawks, spears and knives. Enemies of the Mohawk tribe included the Algonquin, Huron, Pennacook, Lenape, Ojibway (aka Chippewa) and the Mohican tribes together with all the other people they conquered. Mohawk History: What happened to the Mohawk tribe? The following Mohawk history timeline details facts, dates and famous landmarks of the people. The Mohawk timeline explains what happened to the people of their tribe. 1768: Treaty is signed at Fort Stanwix by the Iroquois Confederacy and the British.